We are often asked “what Does SLR mean in the digital camera world. SLR simply stands for single lens reflex. SLR (single lens reflex) refers to the way these camera’s work. When a photographer presses the shutter button, a mirror flips out of the way to reveal the sensor. Some people also refer to them as DSLR, with the D being short for digital. 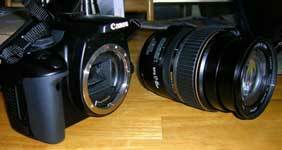 What are the main differences between a digital SLR camera, when compared to a point and shoot? One of the main differences between a point and shoot camera and a digital SLR camera is that an SLR has a detachable lens. In other words, you’re not limited only to the lens that comes with the camera. 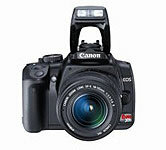 Digital SLR cameras also give you more control over manual settings such as exposure. In many cases they offer a higher resolution. 12mb and higher resolutions are quite affordable nowadays for those purchasing their first digital SLR camera. Another advantage to SLR digital cameras is that they take photographs almost instantly with no lag time. This is useful when taking photographs of moving objects such as children. Wikipedia has information explaining the technical workings of digital SLR cameras for those interested in the hardware details. With prices for digital SLR cameras falling considerably over the last year, they are fast becoming more affordable and popular with amateur photographers as well as professionals. Two of the most popular brands amongst amateurs are Nikon and Canon. Just to recap the original question “What Does SLR mean in Digital Cameras”. It means Single Lens Reflex.